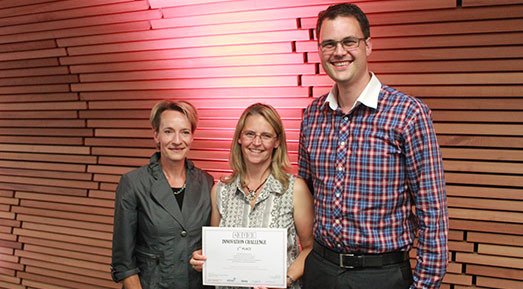 Paula Kersten, Kirsten van Kessel and Duncan Babbage from the MS Energise team have won the AUT Enterprises Limited Innovation Challenge. Their idea is to develop tools for MS sufferers to help them manage key symptoms. Winning the award is a significant step in securing the funds required to develop these tools. The team will also be partnering with world class researchers in the UK , combining their expertise in clinically testing interventions for people with multiple sclerosis. Watch this space for news on progress! Contact Paula Kersten.